There are some authors whose books you just end up reading. King is one such author. It's hardly surprising really when you consider that he's sold over 350 million of the things. Many of his books were difficult to avoid, especially during the eighties, which saw the likes of Cujo, Pet Cemetery and It all hit the book shelves . But with 49 novels under his belt to date, you would have to be the biggest of fans to have read them all. His latest then, is the perfect opportunity to become re-acquainted with this most celebrated of authors, and to reflect on whether he's still as good as memory serves. Jake Epping is far from living the dream. He's recently divorced from his alcoholic wife, teaching kids at a school in Maine. His life is just ticking over, like so many around him. Then, out of the blue, the owner of the local diner, Al Templeton, invites him over. Now Jake has eaten many a time at Al's diner, but this time it's more than just to sample the grilled cuisine. Al has something curious to show him. To see it, Jake has to climb down a few steps in the back of Al's pantry – which is not a euphemism for anything. Although a curious request, Jake obliges. After just a few steps Jake finds himself not only outside of the diner, but also, inexplicably, in another time: the 9th September, 1958 to be precise. He walks around a little and takes in some of the historical colour, before returning to the diner – and 2011 – the way he came. Al sits him down and explains what he knows about the portal. He discovered on his travels that regardless of how long you stayed in the past, you would always return to two minutes after you left, in the present. Plus, if you returned, which would always be at the same time and date in '58, anything you may have changed in history previously would be reset. Jake decides to put the whole time-travelling thing to the test, by going into the past to see if he can change the future of one of his adult students, who had a particularly horrific childhood. This one trip proves to Jake beyond a shadow of a doubt that the past can be altered. He then decides to up the stakes, to see if change could occur on a bigger scale. Really big. What if, for instance, he could stop John F. Kennedy from being assassinated? But as Jake soon discovers, meddling with the past in any way has its consequences. Having been away from King's material for some time, you soon notice that his latest book isn't as horrific as many of his classics. It doesn't stop it from being any less appealing however. Although the premise is completely sci-fi, King doesn't go heavy on the science bits. He doesn't waste time on the whys and wherefores of the existence of such a portal into the past, he chooses instead to merely have it as a transitional tool. What is still obvious is King's accessible style. It's so darn breezy that it just carries you effortlessly through its pages. His main protagonist is an affable character, likeable from the off. He then drops him into a whole new world, one he's familiar with as a teacher, which gives him a completely new perspective. Where King earns the big bucks here however, is in the detail. Just like Robert Zemeckis managed to do visually with his Back to the Future trilogy visually, King manages to do the same by submerging his reader into history with great written skill. It's a truly evocative world that he creates, one that almost feels like a living, breathing character in its own right. It's a hefty book, that's for sure; one that certainly allows time for its characters to develop in full. The only downside is that the story suffers from this somewhat during the final chapters of the book; it would be inaccurate to say that it feels rushed, but the story does appear to come off second best by the end. It may not contain the horror from his earlier work but it's obvious from his pleasing style that it still flows from the same pen. 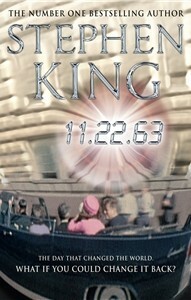 If you haven't picked up a King novel in a while, then this date is the perfect time to return.